Edmonton Oilers’ fans must be scratching their heads over how their organization could own the first overall draft pick in four of six years, including three in a row, and still miss the playoffs. Unfortunately those are the facts as the team took Taylor Hall first in 2010, Ryan Nugent-Hopkins in 2011 and Nail Yakupov in 2012. That trio was then followed up with the addition of Connor McDavid in 2015, but they somehow managed to miss the playoffs every season since 2010 other than 2016/17. In fact, when Edmonton made it as far as the second round two years ago it was the team’s first playoff appearance in 11 seasons. It’s now their only appearance in the last dozen years as they missed out again last season and failed to reach the postseason 10 years in a row before that. Yet things carry on as normal with the franchise and they’ll be tooth and nail to make the playoffs in 2018/19 as well. But when you study the Oilers’ ineptitude closer it looks even worse considering Yakupov turned out to be a bust and Hall was traded to the New Jersey Devils in 2016 for defenseman Adam Larsson. General manager Ray Shero, who made that deal for the Devils, should be charged with grand larceny as it resulted in Hall winning the Hart Trophy with a career year of 39 goals and 54 assists in 76 games last season. As for the 26-year-old Larsson, he’s basically a number two or three defenseman who posted 32 points in 142 games in his first two seasons in Edmonton. Other than Yakupov, it’s hard to argue with the Oilers’ top picks in those drafts. I’m not sure how he was ranked so high, but he’s now back in Russia in the Kontinental Hockey League (KHL). After the Oilers traded him in October, 2016 following four frustrating seasons, the right-winger played briefly with the St. Louis Blues and Colorado Avalanche. At the time of his flight back to his homeland, Yakupov’s NHL career consisted of 136 points in 350 games with 111 of those coming in 252 outings in Edmonton. Looking back at Yakupov’s draft year, we see the Oilers could have taken a player such as forwards Filip Forsberg or Alex Galchenyuk, defensemen Morgan Rielly, Mathew Dumba or Jacob Trouba or goaltender Andrei Vasilevskiy. It’s easy to second guess in hindsight, but those are the cold facts. Okay, so the Oilers made a mistake taking Yakupov and many other teams may have made the same move. But they compounded that incident with another huge error in judgment by shipping Hall out of town. It was a puzzling deal at the time, but many fans sort of forgot about it when the Oilers made the playoffs the next season, which just happened to be McDavid’s first full injury-free campaign year in the NHL. As it stands right now, the Hall trade resulted in short-term success in Edmonton and it’s yet to be seen how things will pan out in the long run. The Oilers got a good player in return in Larsson, but Hall was worth much more than him. At the time of the swap, Hall had produced five 20-goal seasons in Edmonton and racked up 328 points in 381 games. Yes, the team failed to reach the playoffs with him in the lineup, but could he be blamed for that? He seemed to become the squad’s whipping boy even though it was obvious they lacked elite goaltending and a solid defense. For some reason the Oilers stocked up on young, exciting forwards when they drafted first overall and didn’t pay much attention to keeping the puck out of their own net and it has cost them. Imagine how the team may look now with Vasilevskiy in net and Rielly or Trouba on the blue line. Edmonton made the playoffs in 2016/17 largely because McDavid remained healthy played the full season. He’s been everything he was advertised to be and even more as he’s arguably the best player in the NHL as well as the fastest. 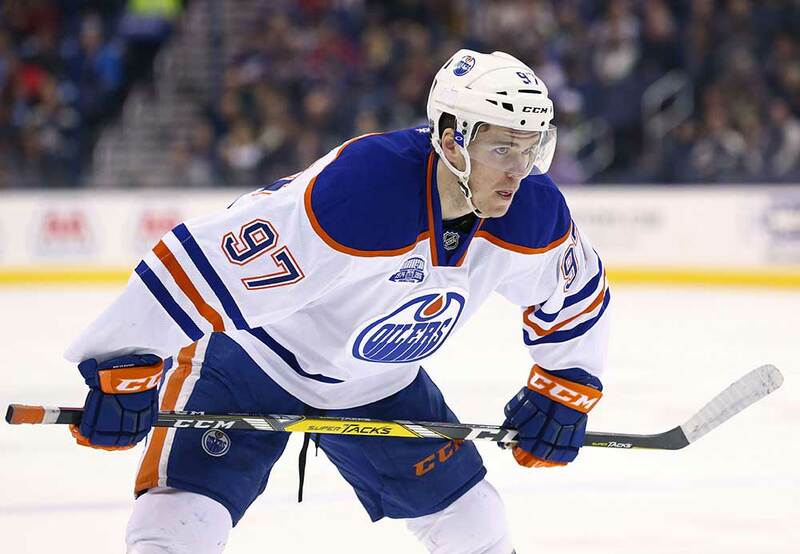 His 2016/17 campaign was something to behold as McDavid took home the Art Ross Trophy for leading the league in scoring with 100 points, was named to the First All-Star Team All-Rookie Teams and captured the Hart and Ted Lindsay Awards as the best and most valuable player in the league. He was a big factor in making the postseason, but the blue line also played well with Larsson, Andrej Sekera, Oscar Klefbom, Matt Benning and Kris Russell helping out. Larsson exhibited physicality and calmness in his own end and helped the Oilers ice their best defensive unit in several years. Goaltender Cam Talbot was also at his best and McDavid got some help up front from fellow youngster Leon Draisaitl. But I think the Oilers were perhaps riding on McDavid’s coattails that season and were caught up in the excitement of it all. Everything seemed to come together for the team that year and they definitely deserved all they accolades that were heaped on them. McDavid was even better last season and won the and Art Ross and Ted Lindsay Trophies again with 108 points and returned to the first All-Star Team. However, Draisaitl’s production slipped slightly as did Talbot’s when the 31-year-old goaltender’s save percentage slipped from 91.9 to 90.8 and his goals-against average rose from 2.39 to 3.02. Fans can probably understand why GM Peter Chiarelli traded Hall a couple of years ago as it was obvious the team needed help on the blue line, but he simply didn’t get enough for him. Hall still had four years to go on his contract and was making $6 million a year, which is a steal for a Hart Trophy winner of his calibre. To make matters worse, Chiarelli then acquired secondary, but tough forward Milan Lucic for seven years at the same price. It’s moves like these which have resulted in the Oilers missing last year’s playoffs and possibly being on the outside looking in again this season. Their top two lines could have featured McDavid, Draisaitl, Ryan Nugent-Hopkins and Hall and if Talbot returned to form in net the Oilers would be a good bet to reach the postseason this year. Like I said, it’ll be touch and go all season long and we likely won’t know if they’ve made the final 16 until the last week of the season. But for the Oilers to be successful they will have to eventually tighten up in their own end and get consistent scoring on a nightly basis rather than netting six goals one game and just one the next. This is still an exciting and strong hockey team, but it can’t afford to play with anything other than stellar goaltending and solid defending.